In Abu Dhabi, there was a visit to the new Louvre and the falcon hospital. In Dubai, there will be Burj Khalifa and gold souks. But, just at this moment, we are in the shade of a lean-to built from date palm fronds, having lunch in the Wahiba Sands with a Bedouin family. For Oman is the heart of our three-part Travel Club Tour of the Middle East, in partnership with our trusted friends at Collette. While hummus and flat bread, rice and chicken are brought, there’s an animated conversation going on between the Omani men, some sitting against cushions on the mats, one stretched sideways on the orange sand, head propped on his hand. I’m following the ebb and flow, passion and humour of it, if not the detail. There are some 250 indigenous varieties of dates in Oman, including prized khalas, khunaizi and fardh. Apparently there are others which give you “pressure”. This is not a carefully groomed tourism moment. This is an authentic meeting between us as travellers and this family, which has rather hounded our Omani guide and facilitator, Abu Musallam Al Shukeiri, to bring us for lunch — the Omanis eating with their hands, balling up rice and biting into it, but bringing forks when our guests ask. Of course Omani rial change hands but that is not the point. Sitting here, surrounded by desert sands and camels, children peeping into the shade, our visit is about connection to place and people. Yesterday, Abu introduced our guests to the enchanting city of Muscat, and particularly to Muttrah, with its old souk. Here, some of us engage in playful banter as we buy perfumed oils — the scent of the Middle East. But we don’t buy frankincense, waiting for our visit to the cultural capital of Nizwa and my friend Ibrahim’s shop, Ahmed Bin Abdullah Bin Salem Al Amri. This is the land of frankincense, collected as sap from Boswellia sacra trees. They don’t grow this far north but, in an unscripted moment, driver Said Al Saifi arranges for us to visit his friend’s property where we see some, along with his feisty Arabian horses. Such is the welcome of Omanis. Oman was rather isolated from the world until 1970 and, since then, modernisation, with good infrastructure and Sultan Qaboos bin Said’s commitment to education, health, the arts and his country remaining neutral and acting as a mediator, particularly in Middle Eastern affairs, has been set against an equal commitment to maintaining tradition. The long dishdasha and distinctive embroidered kummar hat is widely worn by Omani men (even youngsters) as is the women’s long black abaya — fancy trainers visible at the bottom. Aromatic black coffee, flavoured with cardamom, is offered as a matter of cultural necessity. We dine in local restaurants, like the big, open-air Kargeen, full of frankincense smoke and local flavours. We visit the Sultan Qaboos Grand Mosque, with its eight-tonne Swarovski chandelier and its 4343sqm carpet, which took 600 Iranian women four years to weave. It is a truly beautiful place, and the stained glass from French churches is emblematic of Oman’s attitudes. It is Islamic but moderate, following the ancient Ibadi form of Islam which is open to other opinions and points of view. Oman is surprising for its imposing Hajar Mountains — seabed forced to rise by the collision of Arabian and Eurasian tectonic plates, then eroded over aeons. But it is also surprising for the sweet, fresh water that comes from mountain springs, irrigated down valleys to nurture date palm plantations and hanging gardens. 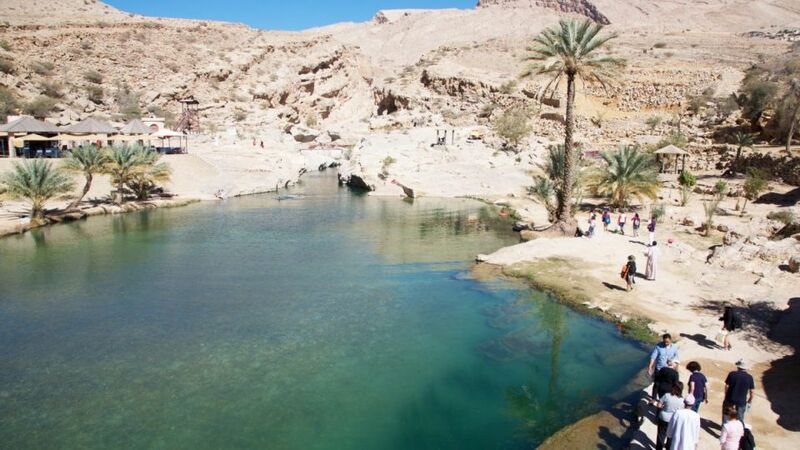 We experience this in Wadi Bani Khalid, and travellers Yvonne Broome and Arlette Mercer also get to have their feet nibbled by the fish. In Nizwa, we visit the souks, its fort and then travel on to Bahla Fort and Jabrin Castle. And, in another moment, oud player Amal Waqar comes to our hotel to meet Arlette, Yvonne, Peter Broome, Susan Kinnear and Clare Mairano and gives an intimate concert. And that’s very much how our days in Oman, with Abu and Asad, have felt. Genuine. A good side trip for passengers on Emirates, Etihad and Qatar. A three-night stopover in Muscat is fine but, trust me, 10 days in Oman is awesome. You can really tour, to remote Arabian dhow-building towns, fishing villages, Bedouin landscapes, the Empty Quarter and the formidable Hajar Mountains. Tour companies do it all in comfort. Muscat, Fins, Sur, Nizwa, Jabal Shams. collette.com.au for all sorts of global touring options. Stephen Scourfield was a guest of Travel Club Tours, Collette, Oman Tourism and Etihad.